The deal gives Shell a foothold in the emerging U.S. electric-vehicle charging market. Shell New Energies, a subsidiary of oil major Royal Dutch Shell, acquired EV charging startup Greenlots, claiming a bigger stake in the emerging electric mobility marketplace. Greenlots will keep its brand and leadership, and will become the “foundation” of Shell’s electric mobility business in North America, the companies said in a statement Wednesday. They did not disclose the price of the acquisition. “Our technology, backed by the resources, scale and reach of Shell, will accelerate this transition to a future mobility ecosystem that is safer, cleaner and more accessible," Greenlots CEO Brett Hauser said in the announcement. Shell has emerged as a leading source of investment in the cleantech space in recent years, as it builds out businesses around “new fuels,” including electricity. The company has also been stocking up on talent from the more turbulent cleantech startup world. It bought Dutch company NewMotion in 2017, gaining access to 30,000 charging stations throughout Western Europe. Last year, Shell led a $31 million investment in Ample, a stealthy EV charging startup that does something with robotics. Shell has also spread money around to distributed energy companies and even a thermal storage startup. The deal marks the third exit for Energy Impact Partners, the utility-backed venture fund that connects its grid edge portfolio companies with the legacy energy companies that could become end users. Its previous exits were Ring and Tendril. Charging networks have to manage several operating parameters: customer satisfaction, grid impacts, electric rates, demand charges and interaction with other distributed energy resources like solar panels or batteries. They sit at the confluence of three major industries: Automakers, electric utilities and oil companies all have a stake in how electric mobility plays out. 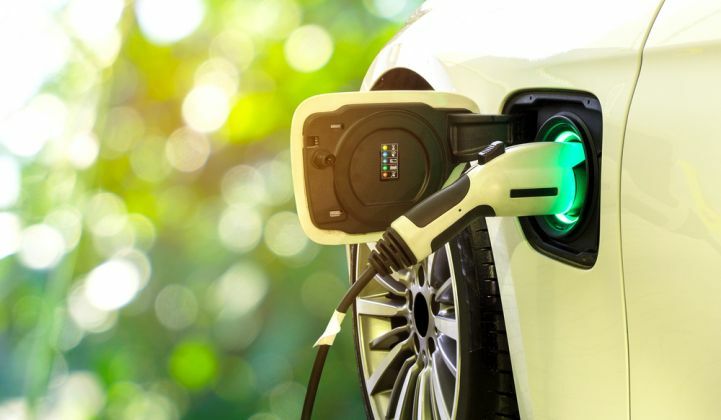 Greenlots had emerged as one of the largest platform companies for electric charging, racking up contracts with utilities including Avista Utilities, Southern Company, Southern California Edison, BC Hydro, Pacific Gas & Electric, HECO and AEP Ohio. It also partnered with car companies such as Volvo Trucks and General Motors. The company scored a major deal with Electrify America, to provide the operating platform for a $2 billion, nationwide charging infrastructure push. Shell’s entry into this market for both North America and Europe brings a substantial source of capital, which will prove useful in paying for the necessary infrastructural upgrades. Shell already has a footprint of gas stations, and has begun introducing electric chargers in its European stations. That financial support addresses a key challenge for charging startups: financial patience, according to Ben Kellison, director of grid research at Wood Mackenzie Power & Renewables. Companies have to invest in infrastructure that might pay off years down the road, if EV adoption proceeds as expected. ChargePoint approached this by raising nearly $500 million for its corporate war chest, Kellison noted. Greenlots, on the other hand, raised less than $15 million since its founding. "Shell could provide Greenlots with the necessary capital to drastically increase the size of their network, and the time needed to invest in prime locations earlier than other providers, accepting short-term losses for long-term gains," Kellison said. The low tally of funds raised also increases the likelihood that Greenlots returned a favorable exit to its investors.